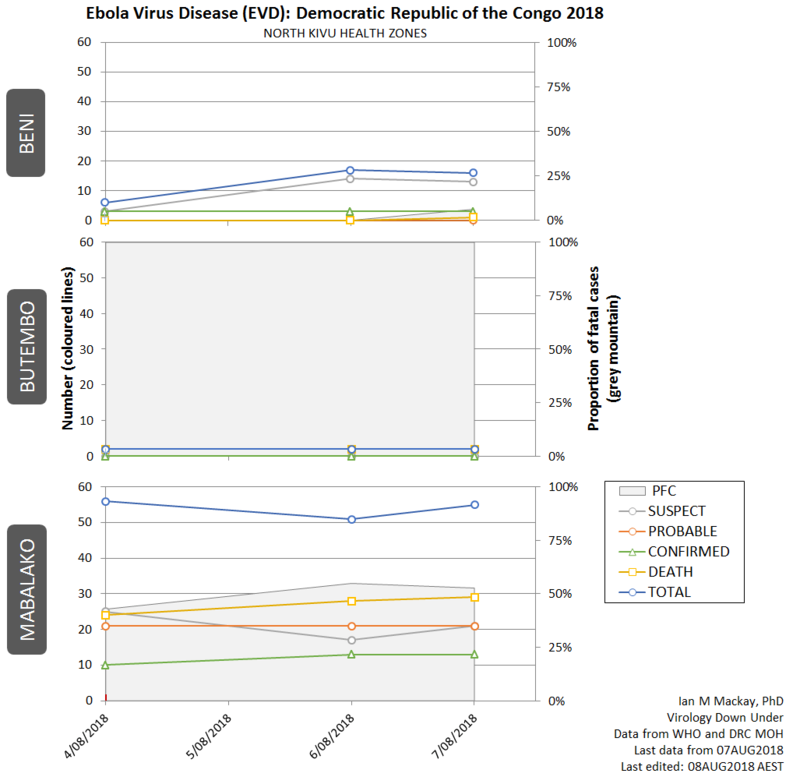 The latest Ebola virus disease (EVD) figures of the Democratic Republic of the Congo’s (DRC) Ministry of Health (MOH) are out and I’ve plotted them below. 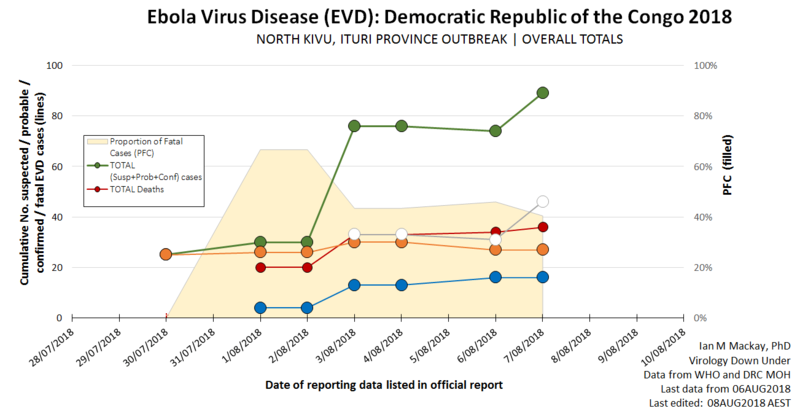 They show steady numbers of confirmed and probable Ebola virus disease (EVD) cases with a predictable rise in suspected cases as the search continues for contacts and those with relevant symptoms (but perhaps other infections). Two new deaths were recorded in North Kivu province; 1 in the Beni health zone (HZ) and 1 in Mabalako HZ. Yesterday’s report defined 966 contacts under observation; an impressive number given how few days have passed since the outbreak was announced. Graphing the cases from 3 of the HZs in North Kivu province that have, or are under investigation for, cases fo EVD. Click to enlarge. No new cases have been reported from Ituri province to the north; none have been confirmed and there remain just 2 probable cases listed. The same 2 listed as fatal I presume. This is good news. Now we await incubation periods to either pass or reveal new cases among contacts of known transmission chains. 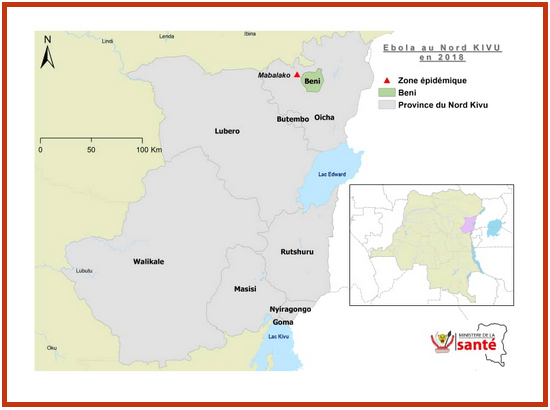 Mabalako HZ in North Kivu Province has been the area with the greatest number of EVD cases and deaths to date. It will be important to watch. the presence of a strain of Ebola virus (EBOV) of the species Zaire ebolavirus as the cause of the outbreak. However, we already knew EBOV was present thanks to highly specific GeneXpert testing. that the strain of EBOV in the eastern outbreak is genetically different. In fact, different enough to allow the MOH to definitively call this the 10th outbreak. A distinct outbreak from that which just finished in the west. Bad luck indeed to have 2 in the same year, but not unique as you can see from looking down the page here or at this, this or this for example 1996, 2003, 2012. Ths is welcome news in one sense – the rVSV-ZEBOV vaccine can be rolled out. And with freezers already in place, this may start happening from today. The ring vaccination approach may not be possible because of security risks, so a “geographic targeting” approach may take its place. Entire villages will be vaccinated. This approach is more vaccine intensive but it should prove safer than tracking contacts in all directions when armed ill-intentioned people are located all around. What was the source of the last two human EVD outbreaks? It’s also worth remembering that we have no data pointing to a specific source for either outbreak. 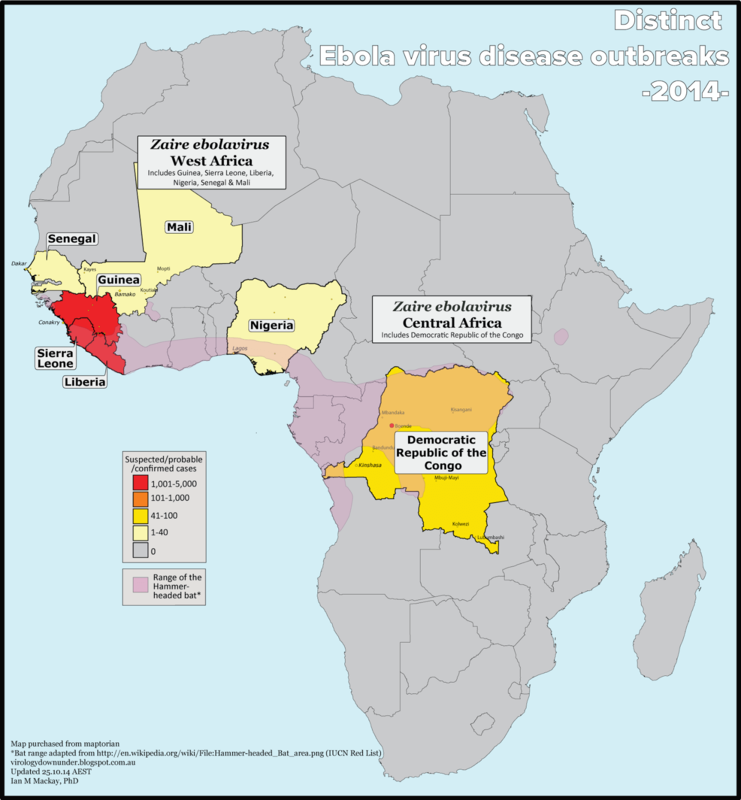 We sort of did have a source for the start of the West African epidemic in 2014. We know that the DRC sits under the flyway of bats which are known to harbour ebolavirus RNA. Whether humans in 2018 had contact with an infected bat or contact with another animal infected by a bat, is unclear. The MOH also includes this handy map of the HZs under investigation, in each of their reports. DRC MOH map from EVD reports.